In large bowl, mix tomatoes, chicken broth, 1/2 teaspoon of the Cajun seasoning and the hot sauce. Add instant rice; stir, and let stand about 8 minutes or until most of liquid is absorbed. Stir in beans, bell pepper and green onion whites. Meanwhile, coat pork chops with melted butter. Rub in remaining 1 1/2 teaspoons Cajun seasoning. 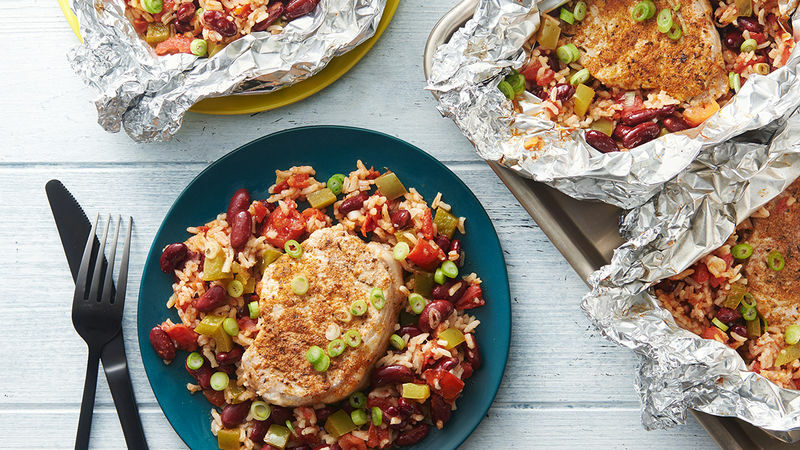 Place pork chop on center of each sheet of foil. Dividing evenly, spoon rice and vegetable mixture around each pork chop. Divide any remaining soaking liquid over tops of pork chops. Place packs on grill over medium heat. Cover grill; cook 10 minutes. Rotate packs 1/2 turn; cook 7 to 10 minutes longer or until pork is no longer pink and meat thermometer inserted in center reads at least 145°F. Remove packs from grill; cut large X across top of each pack. Carefully fold back foil, and garnish with green onion greens. To make in oven, place packs on cookie sheet. Bake at 375°F 30 to 35 minutes or until pork is no longer pink and meat thermometer inserted in center reads at least 145°F. Garnish with green onion greens. Need more heat? Serve with extra hot sauce. For best results, remove any large pieces of fat from the pork chops.